Street entrance on Calle Obregon No. 5A. viewer if they proceed down the long carriageway with bougainvillea covered arches. belonged to the Almada family. 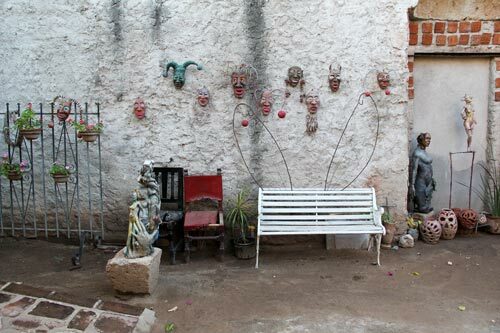 Everything in Álamos has a history. 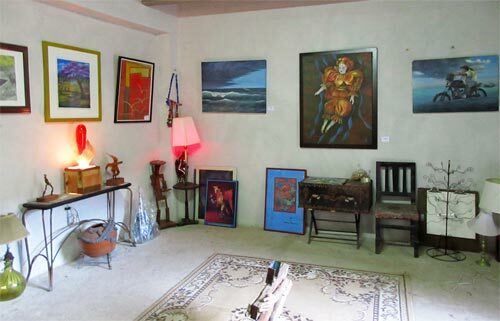 Galeria Rincon del Arte translates into English as the Corner Art Gallery. 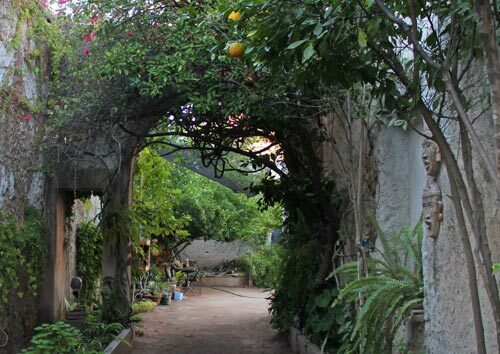 The sounds of the street become muffled as peaceful garden grounds invite one in. welcomed cool shade, natural air conditioning at its best. 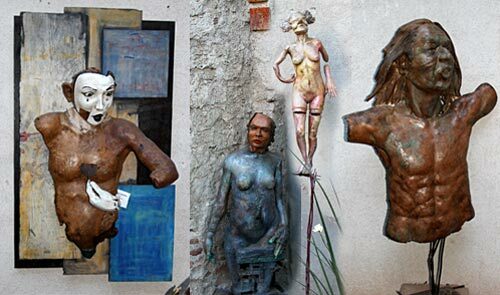 The shaded courtyard is a gallery-sculpture garden unto itself. different shapes and dimensions, beckons. 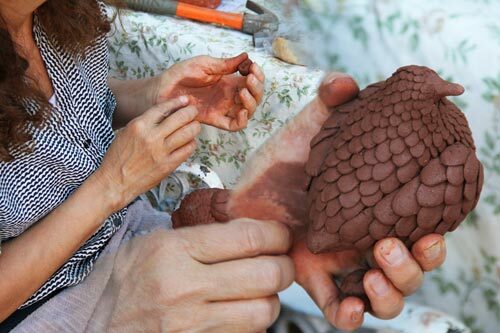 Lupita making art the old way, by hand. talking with an American women who now lives in Álamos, and turned the lights on for me. 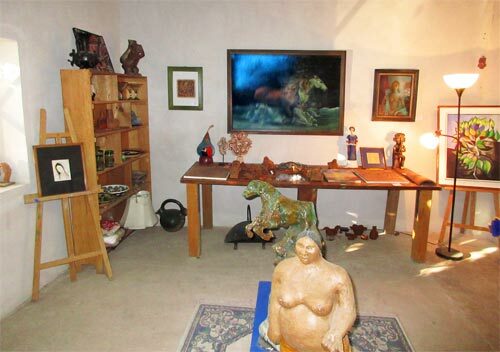 The gallery is a modest room but the artwork is anything but. looks. There is art of all creative expression on the floor, tables, cabinets and walls. 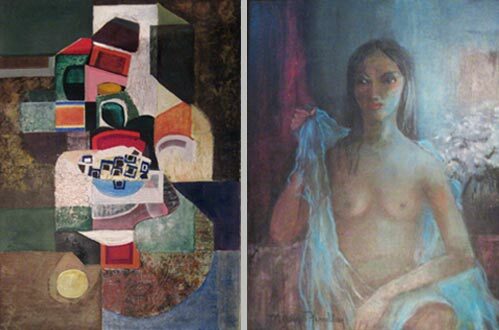 Paintings by longtime Álamos residents Roberto Bloor and Margo Findlay. a calling for these two individuals whose lives impacted many in Álamos. Many medias are on display by capable artists. Arturo Hernandez, Daan Hoekstra, Ana Bertha Waldez and Angel Luzanilla. a colorful stroll down a new art discovery path. 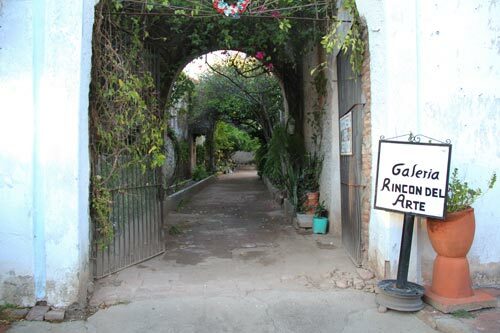 Creative spirits are alive and well presented at Galeria Rincon del Arte. 450 miles from the Arizona-Mexico border. Here the human spirit is on display. They are there, silent, but with a voice. 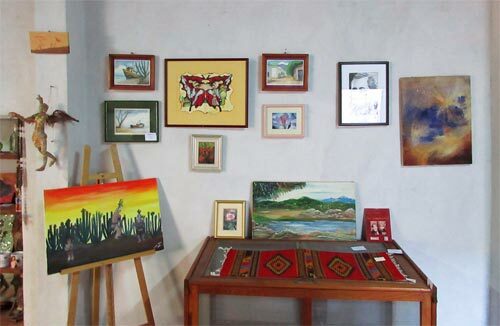 involvement of Tony and Lupita in local and statewide art scenes. 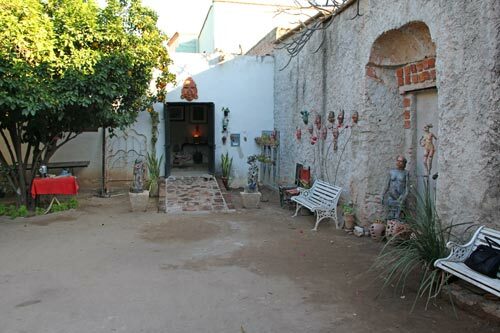 spent an afternoon contemplating all that Galeria Rincon del Arte has to offer. 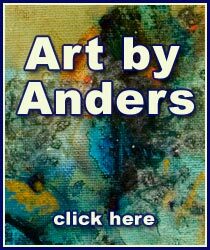 ©2017 Anders Tomlinson and Galeria Rincon del Arte, all rights reserved. This page took 0.325 seconds of computer labor to produce.